Chinese Foreign Minister Yang Jiechi will pay formal visits to South Africa, the Democratic Republic of Congo (DRC), Burundi and Ethiopia from January 7th to 11th, foreign ministry spokesperson Jiang Yu announced Wednesday. 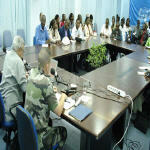 At its weekly press conference of 2 January 2008, MONUC stated that DRC Armed Forces (FARDC) battalions were transported by helicopter in the past week to North-Kivu to ensure the security of the Goma peace conference, envisaged for 6 January. 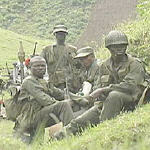 The mission also supplied isolated FARDC units, and those wounded were evacuated to Goma. 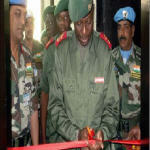 A new military operations centre for the FARDC (DRC Armed Forces) 8th military region was inaugurated in Goma in North Kivu province on 29 December 2007. The centre, which was financed by the FARDC and built by MONUC's Blue Helmets, is another testament to the support that MONUC brings to the FARDC in the restoration of peace in eastern DRC. 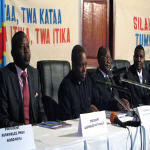 The preparatory work of the conference on peace, security and development in the Kivus was officially opened on Thursday 27 December 2007 in Goma by IEC president and conference coordinator Fr. Malu Malu. 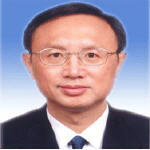 It also marked the beginning of a public awareness campaign for the conference which is scheduled from 6-14 January 2008. The government of the Democratic Republic of Congo has launched an offensive to root out renegade General Laurent Nkunda and other rebels who control parts of the country's east. Efforts to integrate the general and his rebels into the regular army have fallen apart, and now the military has taken up arms. Kari Barber has more. 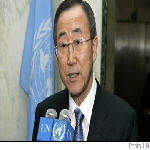 Secretary-General Ban Ki-moon has voiced hope that an upcoming peace summit to be held in the troubled eastern region of the Democratic Republic of the Congo (DRC) will help end a conflict that has caused tremendous suffering and the displacement of hundreds of thousands of innocent people. 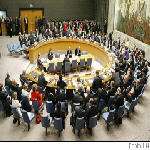 The Security Council today extended the mandate and capacity of the United Nations Organization Mission in the Democratic Republic of the Congo (MONUC) for one year, until 31 December 2008. 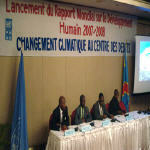 A climate change conference was held in Kinshasa's Grand Hotel on 21 December 2007. Organised by the UNDP who launched the "World Report on Human Development 2007/2008", the conference defined the nature of climate change in the DRC, and presented the challenges for the future. Concerned at the worsening situation in the eastern part of the Democratic Republic of the Congo (DRC), where fighting has escalated between Government and renegade forces, the Security Council today demanded that all rebel groups lay down their arms and immediately stop recruiting children. 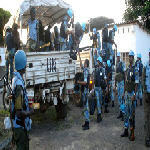 At its weekly press conference of 19 December 2007, MONUC announced that there "appears to be a progressive stabilisation" of the situation, as the FARDC have taken up blocking positions east, west and north of Laurent Nkunda's rebels in North Kivu province.